Dr. Neeraj Kumar, MBBS, MD(Paediatrics), having acclaimed experience of 17 years, is Managing Director of Chaitanya Hospital, Chandigarh. 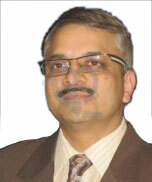 Dr. Neeraj Kumar is an alumnus of Christian Medical College, Ludhiana and PGIMER, Chandigarh. After completing his post graduation in Paediatrics, he started his own practice in Chandigarh. He was one of the first Paediatricians in Tri-City region to provide round the clock emergency care. He was also associated with the prestigious nursing homes of the city to provide care for newborn babies. With his dedication and vision Chaitanya Hospital has grown into a Comprehensive mother and child hospital with an unmatched reputation throughout the region. Dr. Neeraj is a member of various Associations of paediatric societies and is an active participant of workshops & conferences held by these organizations to keep his knowledge parallel to the recent advancements of international standards.